We want to teach our children to follow their dreams, to reach for the stars -- but we also want them to realize that it takes hard work, practice and perseverance to get there. 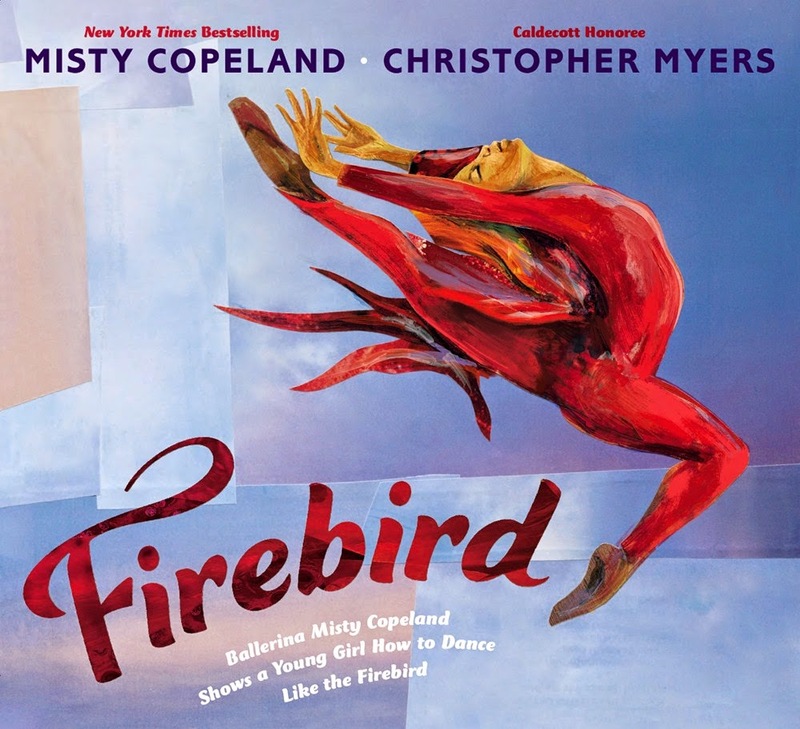 Firebird is a beautiful, stirring new picture book by ballerina Misty Copeland that shares both of these messages, and more. As you begin reading this picture book with children, you'll need to take on two voices, for Copeland creates a conversation between a young girl who dreams of dancing and herself as a professional ballerina. The girl looks up to Copeland, saying, "the space between you and me is longer than forever" -- how could I ever become as beautiful and graceful as you? "you are the sky and clouds and air"
The real magic begins when Copeland turns to the young girl, reassuring her that she was once just as small, just as shy, that "you're just where I started." Through this poetic conversation, Copeland conveys that this young girl can become a professional dancer if she puts in the hours of work, sweat and practice. with work and worlds ahead"
Share this picture book with older students, perhaps 3rd and 4th graders, who can understand Copeland's poetic language and the interplay between the two characters. 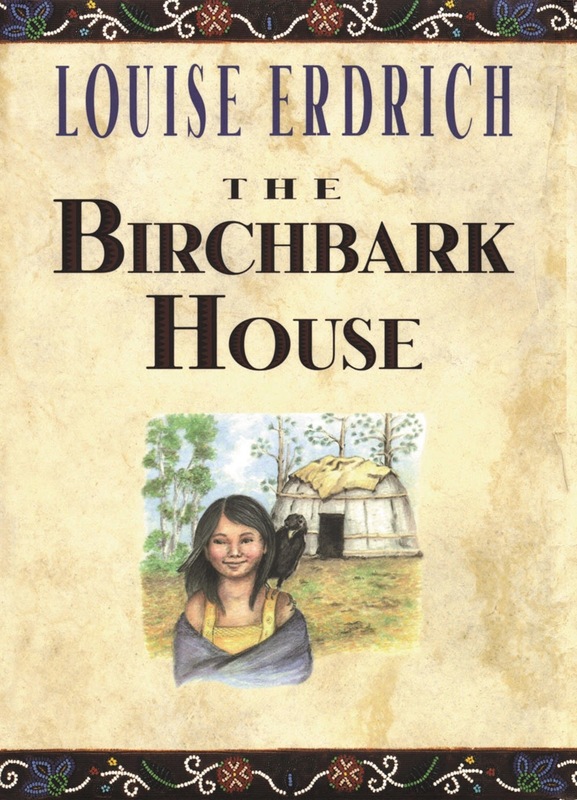 Encourage them to read this story more than once--it is one that really grew in my heart each time I read it. Deepen their appreciation for Copeland's message by encouraging them to learn more about her as a professional dancer. Read her afterword, a note to the reader about why she wanted to write this story. "My hopes are that people will feel empowered to be whatever they want to be... No matter what that dream is, you have the power to make it come true with hard work and dedication, despite what you look like or struggle with." Christopher Myers' artwork brings strength and grace to this story with dramatic lines and colors. 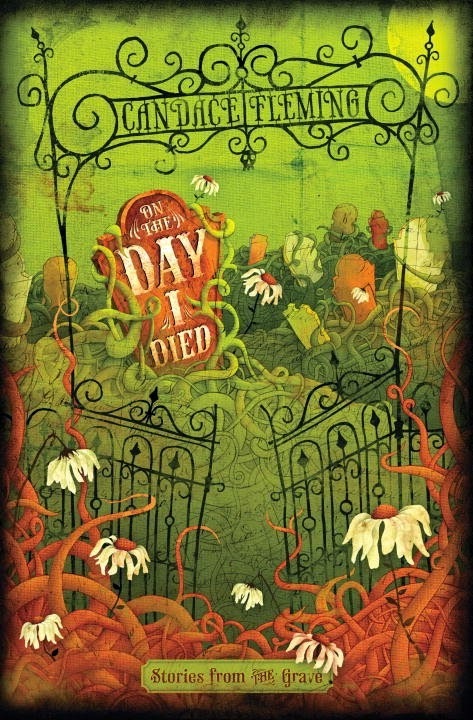 The idea for this book was actually Chris's, as Misty told Jules Danielson in a recent Kirkus article. His mixed media collages contrast the bold colors of ballet with the young girl's grey concrete world, but they also juxtapose angular lines with the dancers' dynamic graceful movement. I can't wait to hear what my students say about this. I think this is a book that they, too, will return to time and time again. The review copy was kindly sent by the publishers, Penguin Random House. Illustrations are copyright ©2014 Christopher Myers. If you make a purchase using the Amazon links on this site, a small portion goes to Great Kid Books. Thank you for your support. Do your children want to be something goulishly great on Halloween? Do monsters delight them? There's no doubt that The Monsterator, with its bold promise of 625 monsters inside, will captivate many young readers who dream of something "screamingly scary." Young Master Edgar Dreadbury finds your standard Halloween costumes a terrible bore. "I wish I could be something screamingly scary. / Something fanged and foul and horribly hairy!" Graves draws readers in with rhyming text that is a delight to read aloud, but he really grabs readers when Edgar steps into The Monsterator. All of a sudden, Edgar is completely transformed "from his teeth to his toes." Edgar crashed through the door. I love how Graves strikes just the right balance between frightening and fun for first and second graders. But what they will love most of all is the surprise at the end, when they can "monsterate" young Edgar, by turning a series of flaps to create hundreds of different creatures. The review copy was kindly sent by the publishers, Macmillan Books. 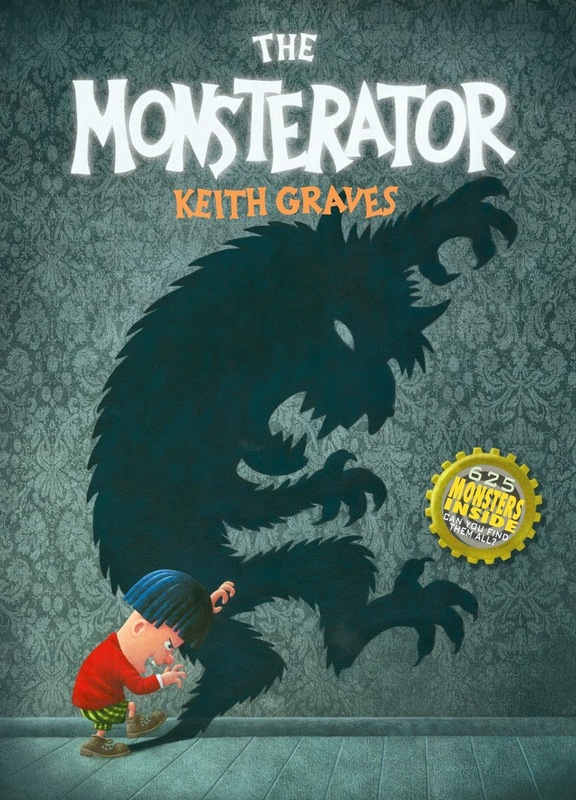 Illustrations of The Monsterator are copyright ©2014 Keith Graves, used with permission of the publisher. If you make a purchase using the Amazon links on this site, a small portion goes to Great Kid Books. Thank you for your support. I have never liked horror movies. Never. Ever. But I know that scary, frightening stories have a real appeal for many people. So how do I recommend them for my students? It's a challenge -- especially gauging that right balance between spine-tingling-fright and oh-no-way-too-frightening-for-10-year-olds. Here are four short-story collections I am recommending to students. Please be warned: if they are too scary, stop reading. That's what I've done in many cases. 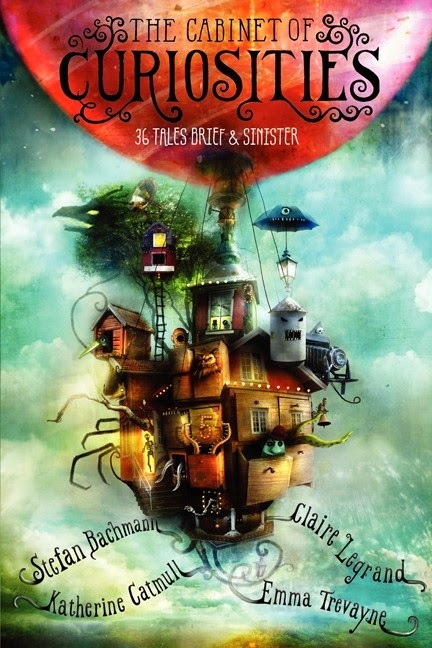 Four "curators"--Bachmann, Legrand, Catmull and Trevayne--have gathered together ominous tales, organizing them into different themes ranging from tricks to cake, luck to travel. There are ghost stories, monster stories and bizarre stories. Some have direct villains, while others set a creepy tone without letting you exactly see what's menacing the main character. The curators have a terrific website Enter the Cabinet with many tales, both ones from the cabinet and others freshly added. My current favorite is The Door Downstairs, with a courageous heroine, eerie setting, and psychological themes. For extra creepy fun, check out the podcasts the curators recorded. Katherine Catmull's recording of "Dark Valentine" is enough to haunt my dreams tonight. Jon Scieszka's collection has great kid appeal, with contributions from 10 different superb authors. I loved Matt de la Peña's story "Believing in Brooklyn" about a wish-making-machine, with its creepy coincidences and touching ending. What would you wish for if you could have anything you wanted? If you like this, check out all the Guys Reads collections. Fleming begins this collection with a version of "The Vanishing Hitchhiker." In her version, the young teen who picks up the hitchhiker is told to take her shoes to the graveyard where she's buried--and he discovers a crowd of ghosts, all wanting to tell him how they died. Fleming sets her story in White Cemetery, an actual graveyard outside Chicago, and each story takes place during a different time period. She deftly weaves in many pieces of historical details, but these never overwhelm the stories. I found these stories more frightening--certainly too frightening for 4th graders, and probably more suitable for 6th graders. All of the stories center on how a teenager died, and that aspect really got to me. I haven't shared this collection with students yet, so I can't gauge kids' reactions. In one story, a boy’s family is vacationing in a house that is taken over by spiders. Now, these aren’t your typical garden spiders. They are spiders who want revenge for the damages done to their forest and homes. Danny starts to get worried when he finds the rabbit cage filled with spider webs, and then realizes that the bundles in the corner are the dead rabbits encased in spider webs. The story proceeds to even creepier, as Danny discovers more ways the spiders have wrecked damage on previous owners of the house. Needless to say, every time I walk into a spider’s web now, I jump even higher. The stories in these collections are NOT for everyone, but I know that many of my students clamor for frightening stories. 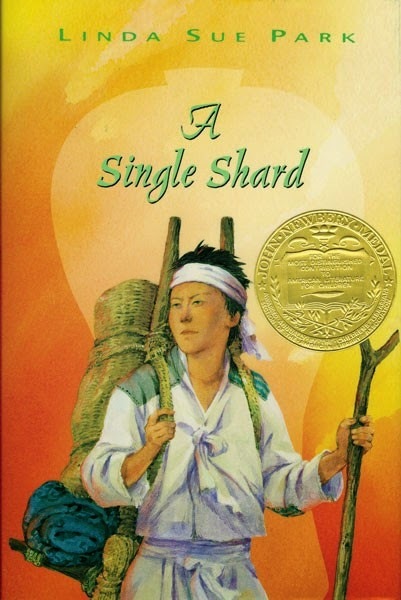 Do you have any favorite short story collections that you hand your 4th, 5th and 6th graders? How do you judge what's too scary? The review copy of The Cabinet of Curiosities was kindly sent by the publishers, Greenwillow Books, an imprint of HarperCollins. The review copy of the other collections came from our school library. If you make a purchase using the Amazon links on this site, a small portion goes to Great Kid Books. Thank you for your support. Young kids love Halloween, but some find scary costumes and stories too frightening. So I'm always on the lookout for books that are a little bit creepy, but are still playful and fun. Two new favorites have lots of kid appeal and throw in practice with counting that's just right for preschoolers and kindergartners. 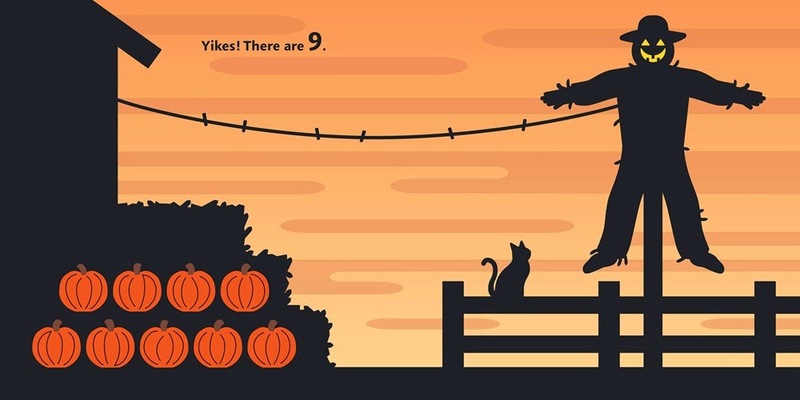 Ten pumpkins start the night neatly stacked outside a farmer's house, but they disappear one by one as they night progresses. 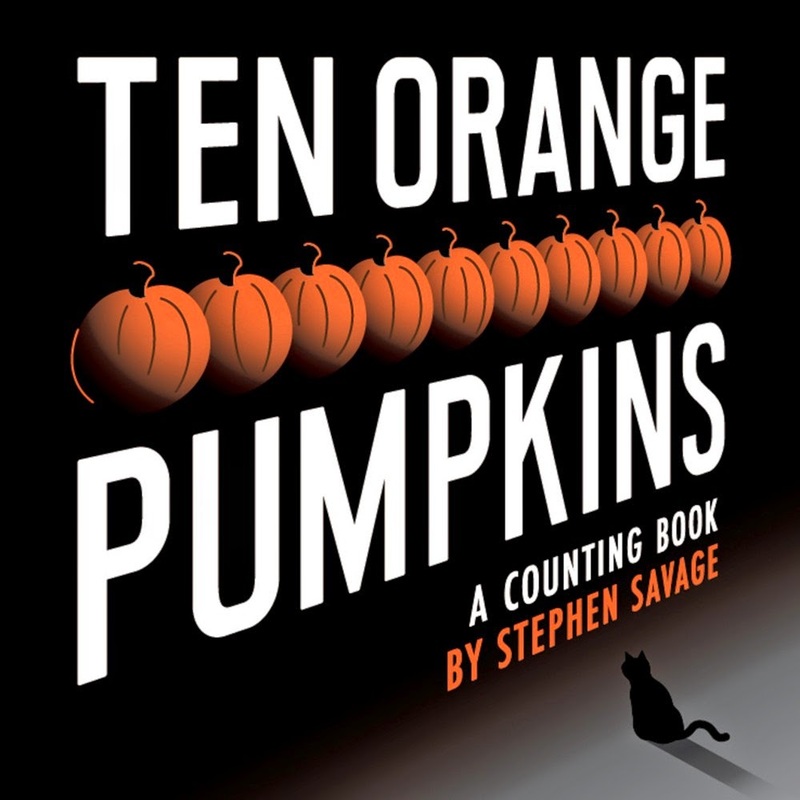 Savage combines bold illustrations with rhythmic rhyming text, giving young readers just enough clues so they can figure out what happens to each pumpkin. I especially love his striking use of silhouettes--they are creepy and dramatic, yet also simple and straightforward. Look how effectively Savage uses the page turn to hook young readers (see the first two pages below). Children will love counting the pumpkins and figuring out where the missing one went. 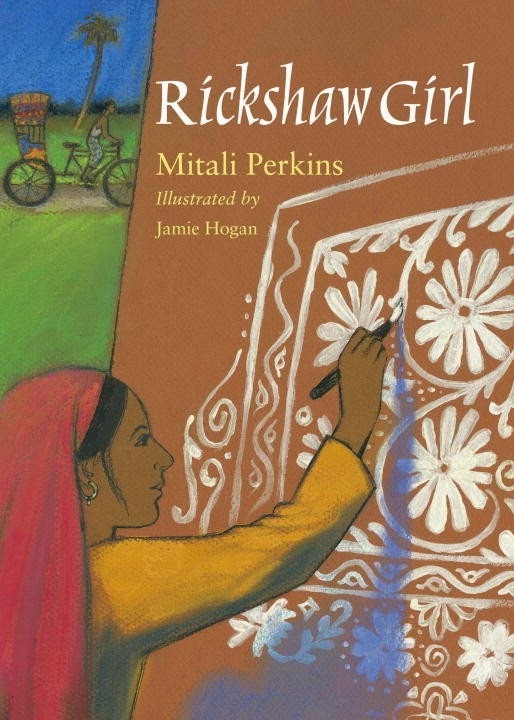 Here's a great example of a book that has so many details in the illustrations that kids can add many layers to the story beyond the text--use this to talk with kids as you read, with prompts like "So what do you notice?" and "Oh, so what happened here?" Tonight will be a spooky night." Another new favorite with our kindergarten teachers is Not Very Scary. They love this cumulative story not only for its counting practice, but also for its message. While we all might get a little bit scared at Halloween, it's really just all our friends having fun. Melly, a cute litte monster, is excited to walk over to her cousin Malberta's house for a Halloween party. Sure it's a gloomy night, but Melly isn't scared--even when she sees "a coal-black cat with an itchy-twitchy tail." She tells herself how brave she is, but readers can tell that she's actually getting scared. Turn the page, and Melly sees "two skittish skeletons" dancing along after the cat. Young children know just how Melly feels, getting more and more frightened as each ghoulish creature turns up. This makes the final resolution all the more enjoyable, as Melly realizes that they are all just Malberta's friends coming along to the Halloween party. Brendler uses wonderfully descriptive language, full of alliteration (grimy goblins, spindly spiders) that makes reading it aloud a joy. Pizzoli's illustrations strike just the right balance, emphasizing the silly fun each creature brings, but never making them too scary. I had a great time reading about his illustration process on his blog and over at his interview at Seven Impossible Things. 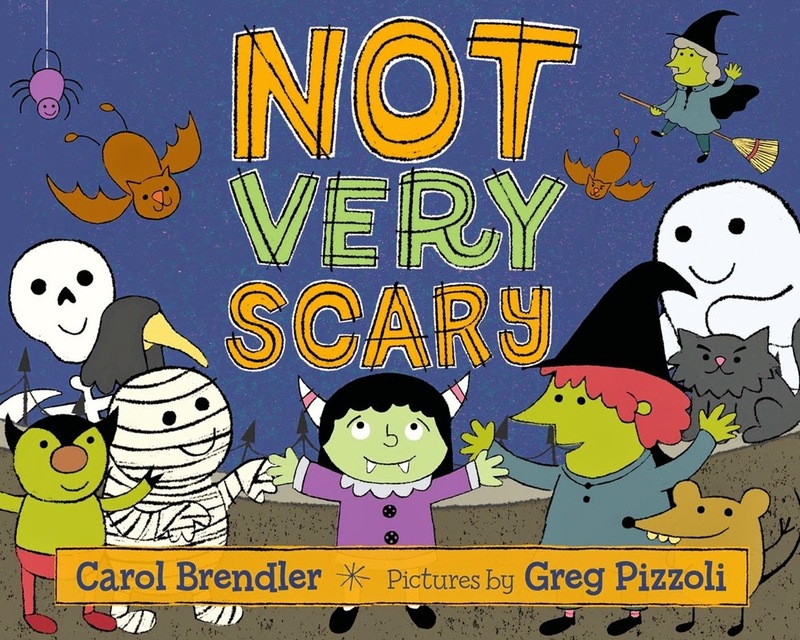 The review copy of Not Very Scary was kindly sent by the publishers, Macmillan Books. The review copy of Ten Orange Pumpkins came from our school library. If you make a purchase using the Amazon links on this site, a small portion goes to Great Kid Books. Thank you for your support. Kids get so excited about Halloween -- and I love tapping into that excitement in the library, especially if I can hook more kids into reading. 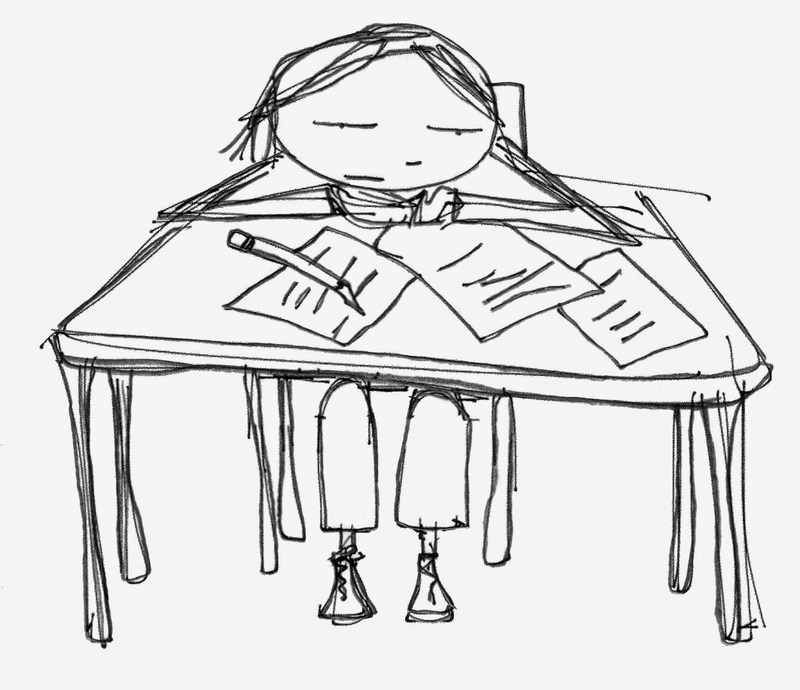 Writing for beginning readers must be one of the most difficult tasks. Here are two books that are goofy-scary, funny but with enough creepiness to keep young kids reading. 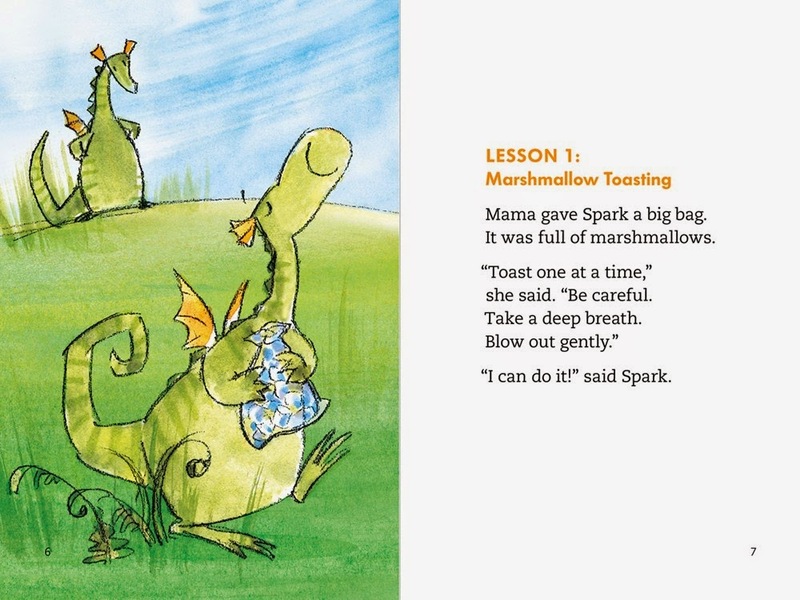 These stories, part of a favorite series with 1st and 2nd graders, are ideal for reading aloud. Each poem is meant to be read by two voices, alternating back and forth. Hoberman uses the spooky settings creating delightful fun and celebrating joy in reading. 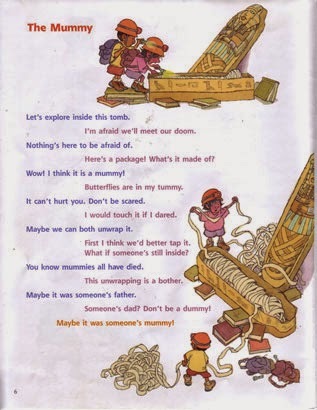 Here's the beginning of "The Mummy" as two kids go exploring and discover a mummy. "Let's explore inside this tomb, / I'm afraid we'll meet our doom." I love the rhythm and rhyme of Hoberman's text, and Emberly's pictures reach just the right balance between goofy and creepy. 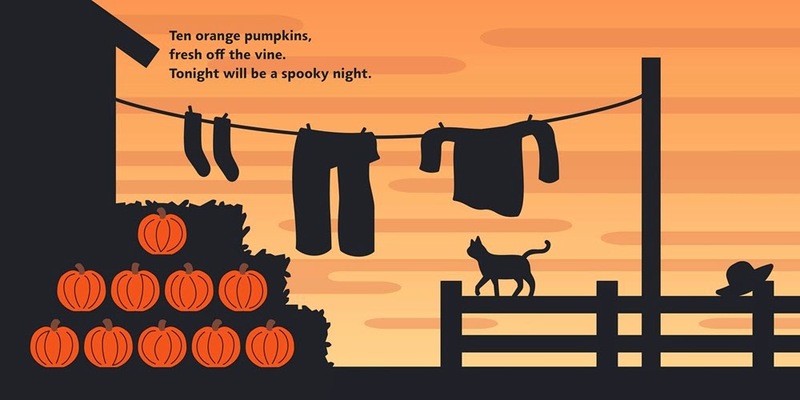 Hoberman's poems focus on thirteen different Halloween mainstays, ranging from "The Skeleton" to "The Witch and the Broomstick." Seek out all the titles in this terrific series. Norm is a nervous about his first sleepover--it's going to be at school, and it's his first time sleeping away from home. "I miss my bed already," worried Norm. 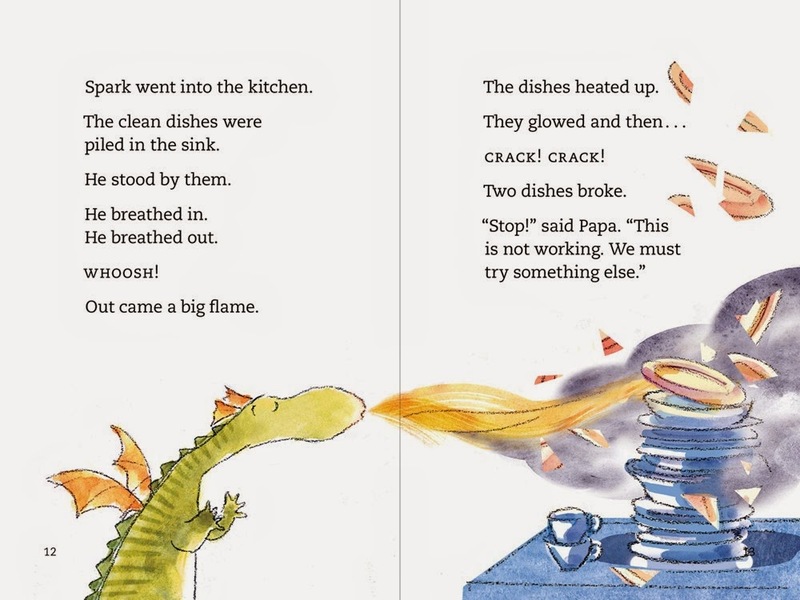 Kids will relate to Norm's worries, but they'll laugh at all the word play in this story. 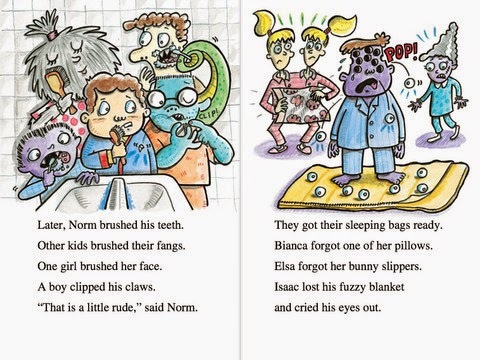 Norm's friends at school are all monsters, from Gary the ghost to Harry the werewolf who turns hairy. Keane does a great job creating funny interplay between the words and pictures. Below, you can see that Isaac, the purple monster in the blue PJs, is literally crying his eyes out -- and they're bouncing all around him. 2nd graders love this play on words, plus the silly gross-out factor. 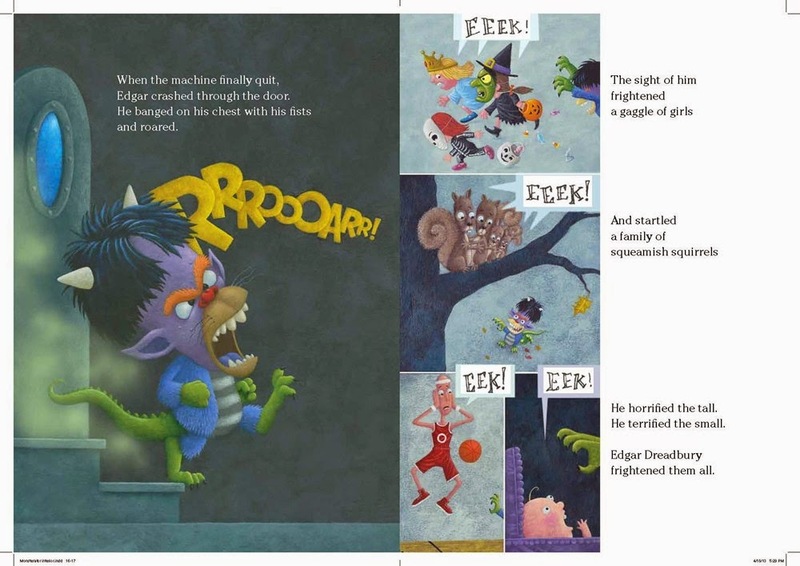 Keane's Monster School series works well for kids who can read longer sentences on their own, but still want short, high-interest stories to keep them engaged. Are there other monster or ghost stories that work well for your developing readers? Our superhero beginning readers are also in high demand right now, especially with kindergartners and first graders. 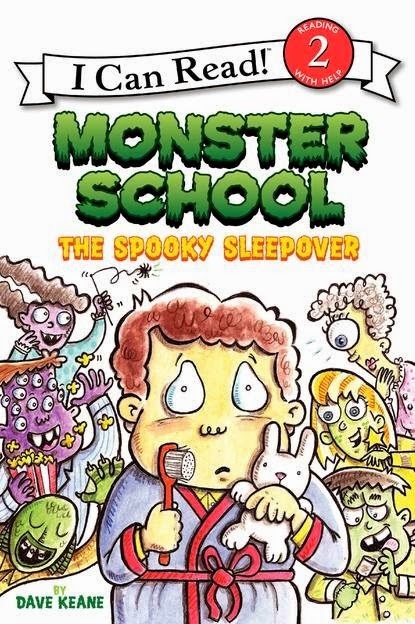 The review copy of Monster School was kindly sent by the publishers, HarperCollins Publishers. 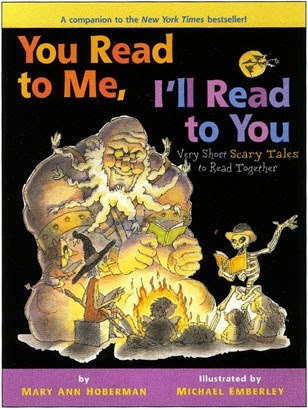 The review copy of You Read to Me, I'll Read to You came from our school library. If you make a purchase using the Amazon links on this site, a small portion goes to Great Kid Books. Thank you for your support. 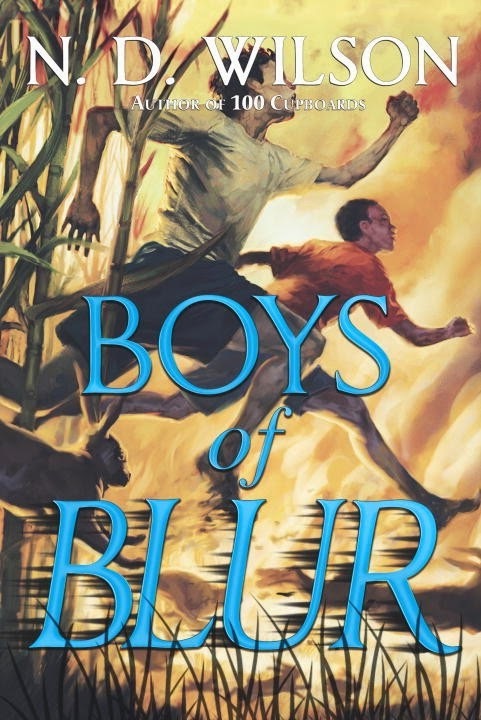 Earlier this year, several authors banded together to put out the cry: #WeNeedDiverseBooks. What started as a call for action quickly turned viral, drawing the support of librarians, teachers, booksellers and authors nationwide. This past weekend's KidLitCon, with its focus on diversity and speaking out, prompted me to share this presentation below. Our community in Berkeley is incredibly diverse, and I constantly try to seek out books that represent a wide range of perspectives. I want my students to be able to see themselves in books, and I want them to be able to see into others' worlds. Although the vast majority of children's books still represent the dominant white perspective, there are many books that share diverse points of view. Our responsibility, as parents and librarians, is to seek out and celebrate books that represent a wide range of perspectives. Below is my start at that -- a celebration of diverse books for children ages 4-14. Most are new, but some are also favorites that librarians in my district have recommended. Please let me know if there are other new diverse titles we should recommend to kids, and I will update this presentation in a few weeks. I have read many, but not all of the books in this presentation. All come with a recommendation from a fellow book-lover that I respect. If you make a purchase using the Amazon links on this site, a small portion goes to Great Kid Books. Thank you for your support. I love reading stories aloud to children, but as a busy mom I know there are times my kids want to listen to a story when I just have too many other things to do. This even happens in the library! At Emerson, we have loved showing kids how they can listen to stories on the computer through Storyline Online. While this doesn't replace reading stories with our kids, it's a wonderful resource to know about. Here's one of our favorite stories: The Library Lion, by Michelle Knudson, read aloud by Mindy Sterling. 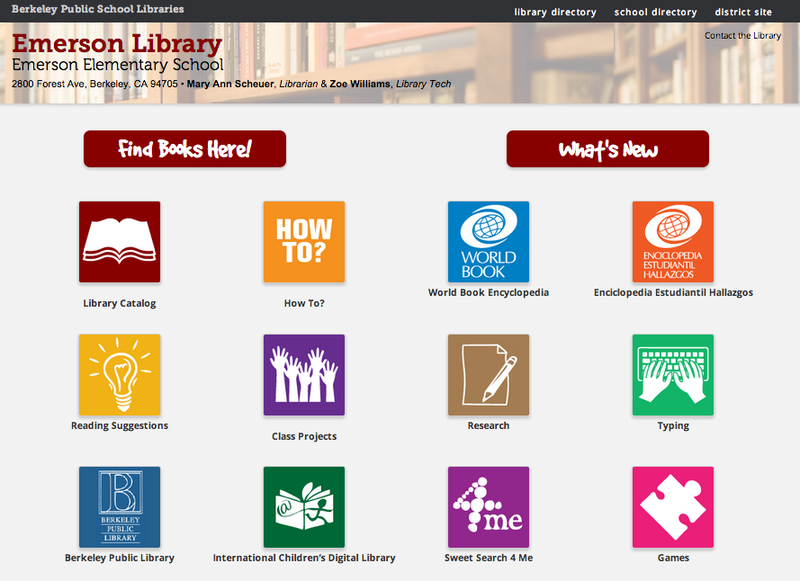 Let us know what you think of these resources. We'd love to know resources your kids enjoy using at home. I want to say special thanks to colleagues at BUSD DigiTech's team, especially Becca Todd District Library Coordinator, for helping marshal such a terrific collection of digital resources for elementary children. My heart is feeling very full right now, and I hope you'll join me reading this special guest post. 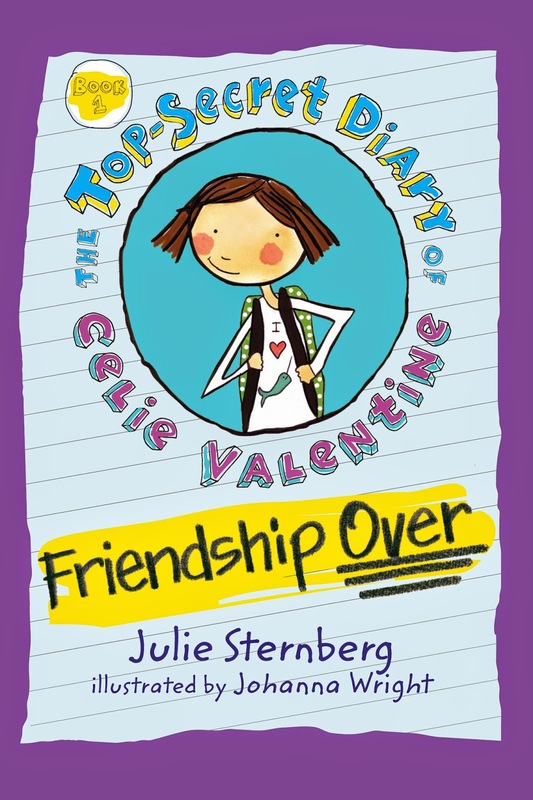 Julie Sternberg recently asked me to help celebrate her new book, Friendship Over: The Top-Secret Diary of Celie Valentine. I said yes right away, since my students love love love Like Pickle Juice on a Cookie. But I decided on a spin -- I wanted to hear a little more from Julie about her thoughts on friendship and how we can help kids be good friends. Berkeley elementary schools have just adopted the Toolbox Project social-emotional learning curriculum. As our districts' announcement stated, Toolbox "teaches critical social competencies necessary for academic and life success such as: resiliency, self-management, and responsible decision-making skills." But really, it teaches us how to be good friends, how to create a community together. I wish I could go back in time and give this toolbox to my fourth-grade teacher to use with our class. She struggled and struggled to help us resolve conflicts and manage our emotions. She didn’t have difficulty because she was inexperienced or untalented—far from it. Our class just somehow tended to bring out the worst in each other. Our teacher led several discussions on kindness and respect, but they made little difference. Then a boy grabbed a girl in an extremely sensitive, private area. We all found it horrifying. After that, our teacher took an unusual step. She cut the biggest heart I’ve ever seen out of butcher paper. Then she split that heart into two jagged pieces. She taped one on the far left side of one of our classroom walls, and the other on the far right. When she’d finished taping, she told us that the heart of our class had been broken. Only by being very kind to each other could we mend it. From that time on, at the end of every school day, she’d give an official assessment of our behavior. If we’d been kind to each other, she’d move the pieces of broken heart closer together. If not, she’d inch them farther apart. When the heart was finally whole again, we had a party with lots of candy. Part of me loves this broken-heart strategy. When my daughters have long and needless fights, I consider cutting an enormous heart in two and taping the pieces far from each other in our apartment. But I know the strategy is flawed. Because I don’t remember how my classmates and I managed to be kind enough to each other to mend our collective heart. I just remember succeeding, and getting candy. 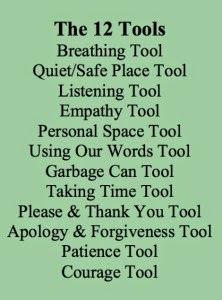 Instead I now see that I should tape up in my apartment the Twelve Tools for Learning, so we can all practice the skills that would help us manage our emotions and prevent conflicts from escalating. I particularly love the “Quiet/Safe Place” tool. I love the idea of saying, in the heat of a senseless battle, “Let’s all three go find a ‘place of rest and peace where we can gather ourselves.’” It seems so much nicer than shouting, “BOTH OF YOU GO TO YOUR ROOMS! NOW!” Which I might have done once or twice, or a hundred times, in the past. It would have been interesting to use the Twelve Tools before I wrote FRIENDSHIP OVER, the first book in the series THE TOP-SECRET DIARY OF CELIE VALENTINE. 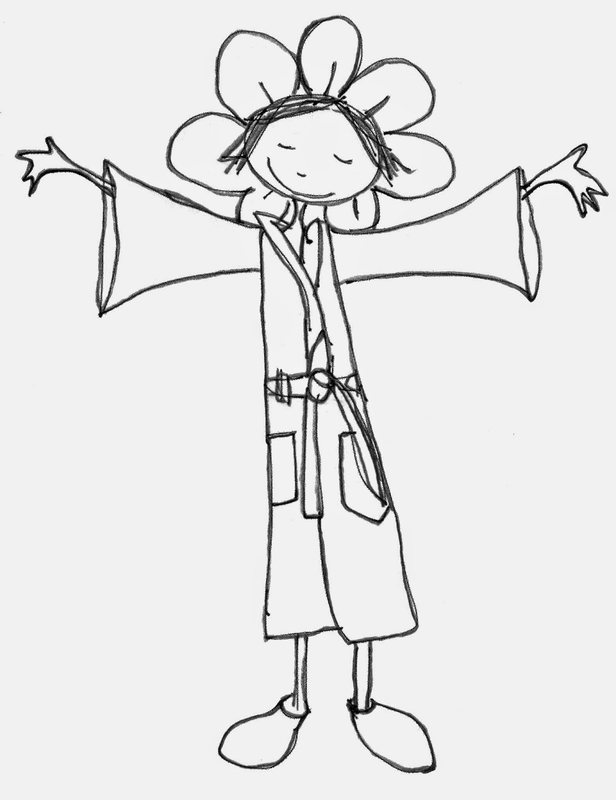 Celie has all kinds of difficulty managing her emotions, and I would love to have her try the tools. The “Garbage Can Tool” might be my favorite for her: “I let the little things go—Put it in the garbage can and walk on by.” This would NOT be easy for Celie (though it would certainly be helpful). And it would be so much fun to write the scenes in which she tries, and fails at first, and ultimately succeeds. It’s something I’ll keep pondering. Because there are Celie sequels to come! I know my students are really going to enjoy reading Celie. She struggles with how to be a friend, how to be true to her own feelings but respectful of others. I wonder if Celie uses drawing and writing in her diary as a way to find a "quiet/safe place" -- somewhere she can go in her mind to sort through her feelings, calm down, and remove herself from conflict. Please enjoy sharing Friendship Over: The Top-Secret Diary of Celie Valentine with kids who like realistic fiction. As the starred review from Kirkus says, "This satisfying slice-of-life story about the permutations of friendship and family resonates." Julie Sternberg is the author of the best-selling Like Pickle Juice on a Cookie and its sequels, Like Bug Juice on a Burger and Like Carrot Juice on a Cupcake. Like Pickle Juice on a Cookie is a Gryphon Award winner and a Texas Bluebonnet Award finalist; Like Bug Juice on a Burger is a Gryphon Honor Book, a Pennsylvania Young Reader’s Choice Awards Nominee, and an Illinois Monarch Award Finalist. 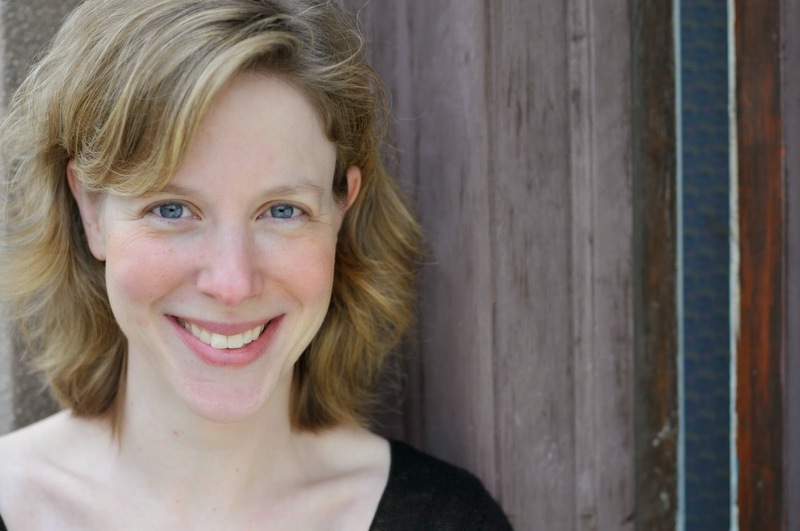 Formerly a public interest lawyer, Julie is a graduate of the New School's MFA program in Creative Writing, with a concentration in writing for children. She lives with her family in Brooklyn, New York. 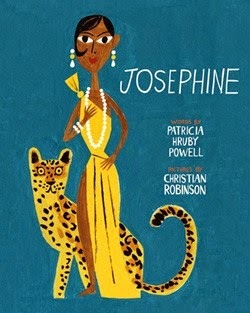 For more information about her life and work and to download free activity materials based on her books, visit her website: juliesternberg.com. Check out the other stops on Julie’s blog tour! Illustrations copyright © 2014 b Johanna Wright, used with permission of the publisher. 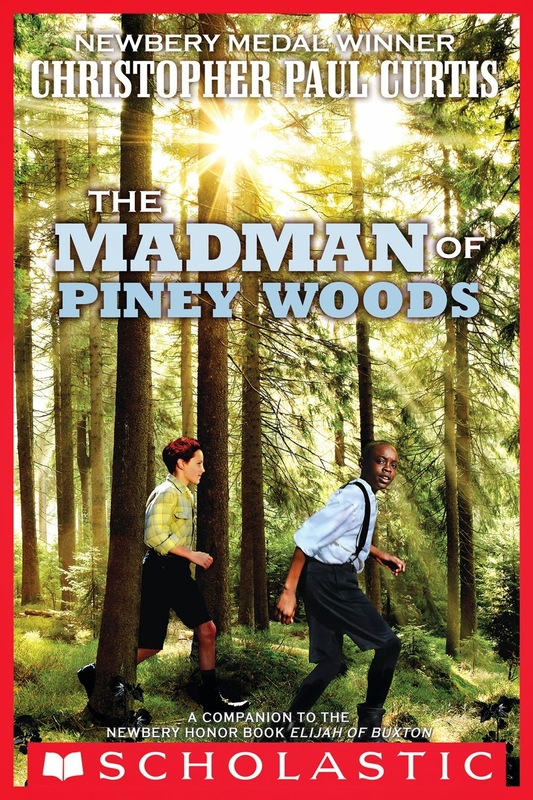 The review copy was kindly sent by the publishers, Boyds Mills Books. If you make a purchase using the Amazon links on this site, a small portion goes to Great Kid Books. Thank you for your support. 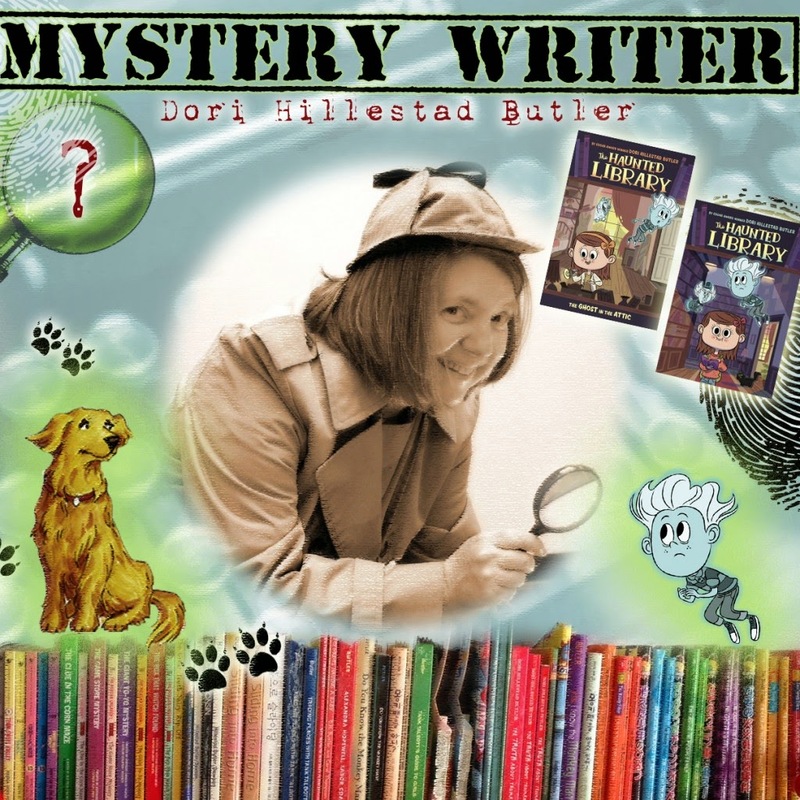 Today, I have the great pleasure of chatting with Dori Hillestad Butler, author of the new series The Haunted Library. Read on below, but also check out this great video on Open Road Media. It will give you a sense of the joy that Dori brings to writing for kids. 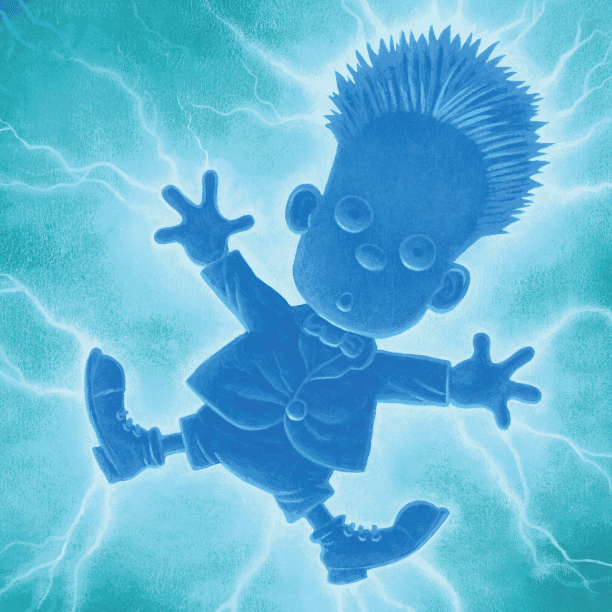 Kids new to chapter books will have fun with The Haunted Library, with its blend of mystery, humor and kid-powered detective work. MAS: How did you come up with the idea of a haunted library? DHB: I just combined two of my favorite things...ghosts and libraries! The idea for the series came while I was writing book 6 in my Buddy Files series. My husband thought I was putting too much emphasis on the ghost in that story and not enough emphasis on the dog. He said, "If you want to write a ghost series, write a ghost series. This one is your dog series. It needs to be more about the dog." He was right. So I streamlined that story a little more and then started on the Haunted Library. The "Wohleter Mansion" is the house I see in my head when I picture the Haunted Library. 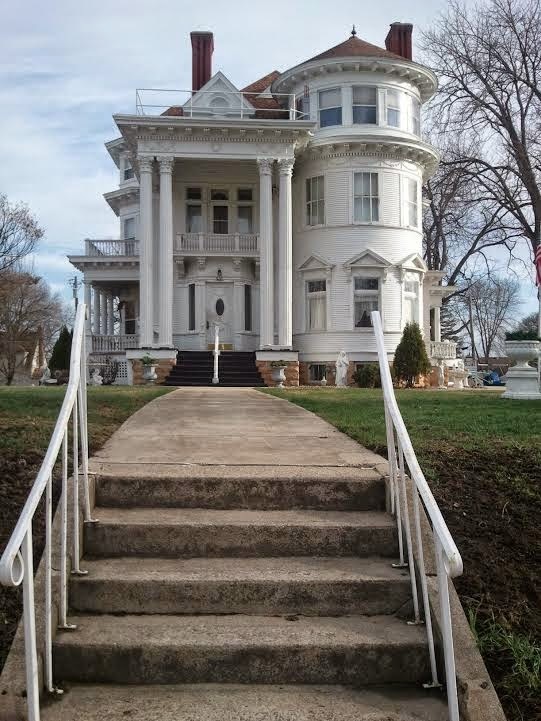 This was also a house in my hometown. I LOVED that house as a kid. Not that I was ever inside it. But I used to ride my bike past it all the time just because I liked to look at it. Now it's probably good that I was never inside because I can imagine the inside however I want. I imagine the "library" on the entire first floor. Claire and her family live on the second floor. And the third floor is storage. DHB: Not that I know of. But I'd sure like to visit one! Assuming the ghosts are friendly, that is. MAS: I really enjoy the way you make ghosts friendly. Our teachers want to know: Do you keep a writer's notebook? What do you put in it? They ask their 2nd graders to keep writer's notebooks. DHB: I do! Several of them, actually. One is really just a journal where I make to-do lists and keep track of progress made on various projects. I also record writing related events/phone calls as they happen. The others are notebooks for each of my projects. I brainstorm ideas in those notebooks. MAS: Are there any other images that inspired you as you wrote the series? DHB: Definitely! The "Fairmont School" is the school I saw in my head when I wrote about the "old schoolhouse" where Kaz lived with his ghost family. Except I remember the school looking a lot more rundown! That was the first elementary school in the town I grew up in. But it's clearly been restored, which I think is really cool! 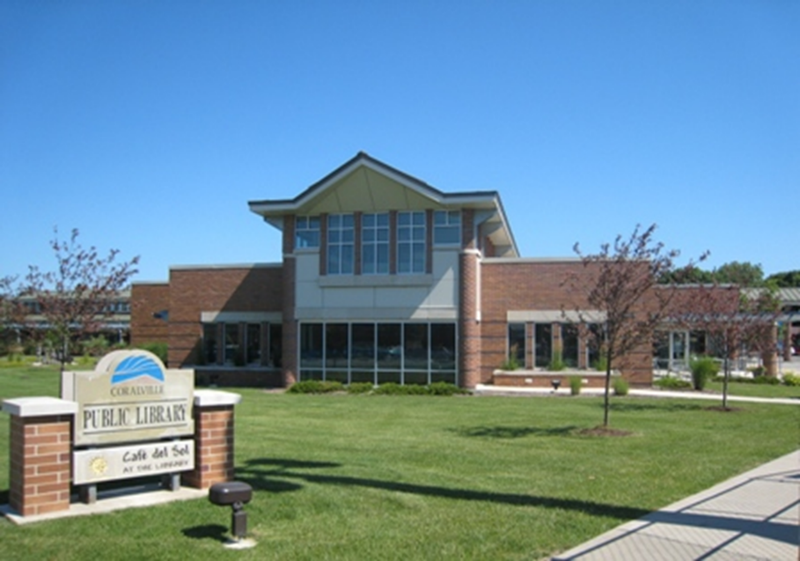 I've always loved libraries. And I've always loved writing in libraries. 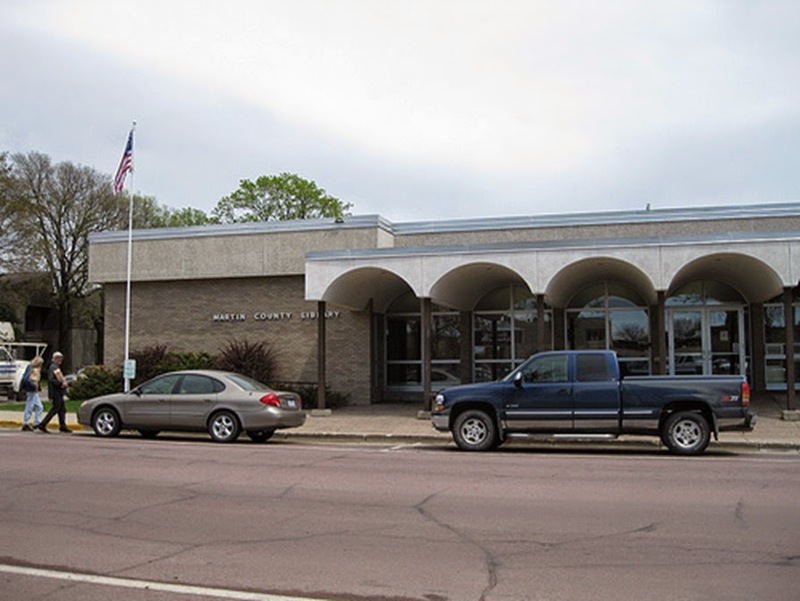 Much of the first three Haunted Library books were written in the Coralville Public Library (see the picture below) in Coralville, Iowa. I don't live in Iowa anymore...now I live in the Seattle area. But I went back to Coralville to launch this series...at the library! It was the best place to launch this particular series! 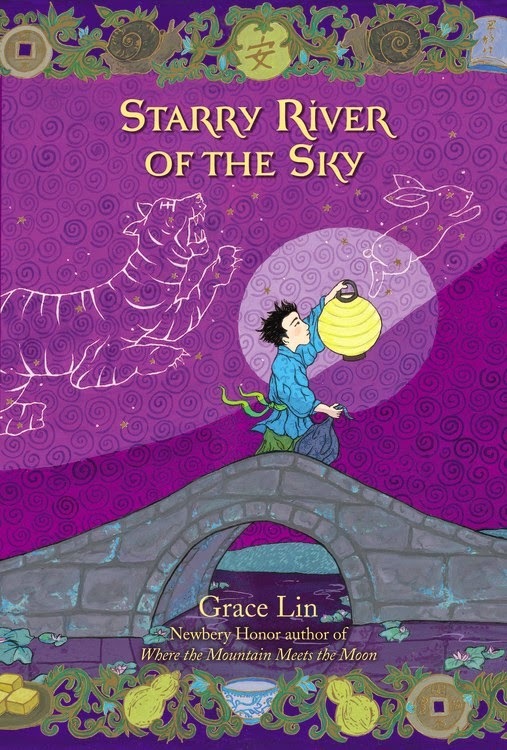 MAS: What are some other mysteries you like to recommend for 2nd and 3rd graders? 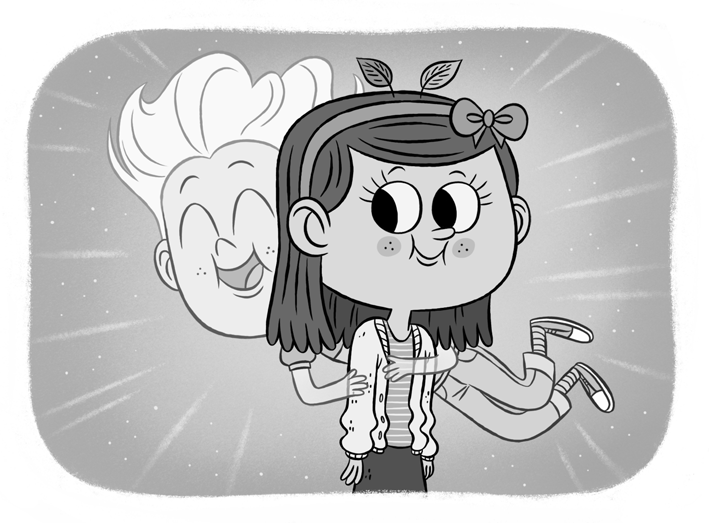 DHB: Well...my Buddy Files series is also aimed at 2nd and 3rd graders. It's about a school therapy dog who solves mysteries and the books are told from the dog's point of view. 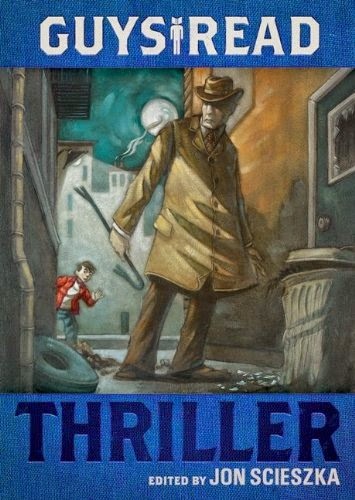 There's also David Adler's Cam Jansen series...Encyclopedia Brown...and the Boxcar Children. MAS: Thanks so much for taking the time to chat, Dori. It really means a lot to my students to think of real authors work hard at writing stories, just like they do. DHB: Thank you, Mary Ann! One of the most important things to me is inspiring kids to read. 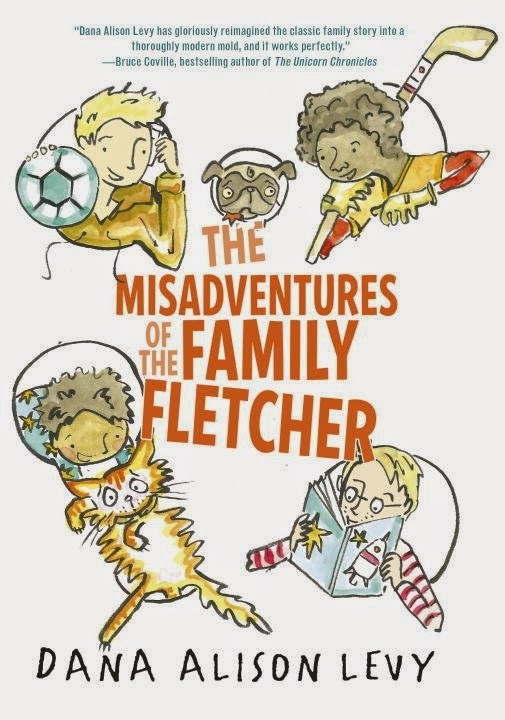 The review copy was kindly sent by the publishers, Penguin Books for Young Readers. If you make a purchase using the Amazon links on this site, a small portion goes to Great Kid Books. Thank you for your support. New readers love finding series that make them laugh and bring them back for more adventures. These chapter books fill an important step in children's reading development. 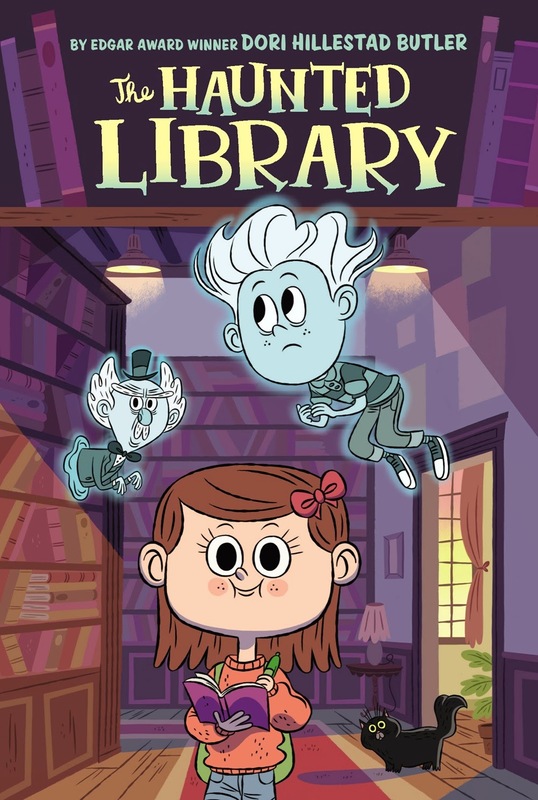 I was excited to hear that author of one of my favorite series, The Buddy Files, has just written a new series: The Haunted Library. I think our 1st and 2nd graders are going love this silly mix of humor, ghosts and mystery. When the Outside wind blows Kaz away from his home and separates him from his ghost family, it's a scary thing. Kaz finds a new home and discovers a human girl who can see him. It's unsettling at first, but Claire is friendly and reassures Kaz that she can see lots of ghosts. In fact, she has a ghost notebook where she keeps track of all her ghostly sightings! Kids will have fun learning the ins and outs of Butler's ghost world, but they definitely won't be scared. Damant's cartoonish illustrations emphasize the humor involved, and the friendliness of each character. Kaz and Claire set out to solve the mystery of the library ghost -- trying to figure out who's turning off the lights and scaring the library patrons. Kaz wonders if it's his lost brother, and Claire wonders if her grandmother knows more than she's letting on. 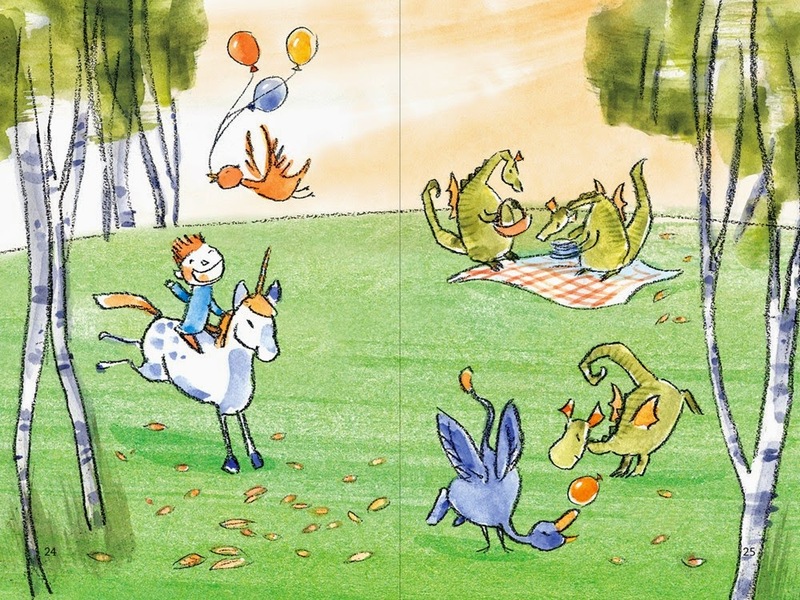 I especially love the interplay between the simple sentences and the illustrations in this chapter book. 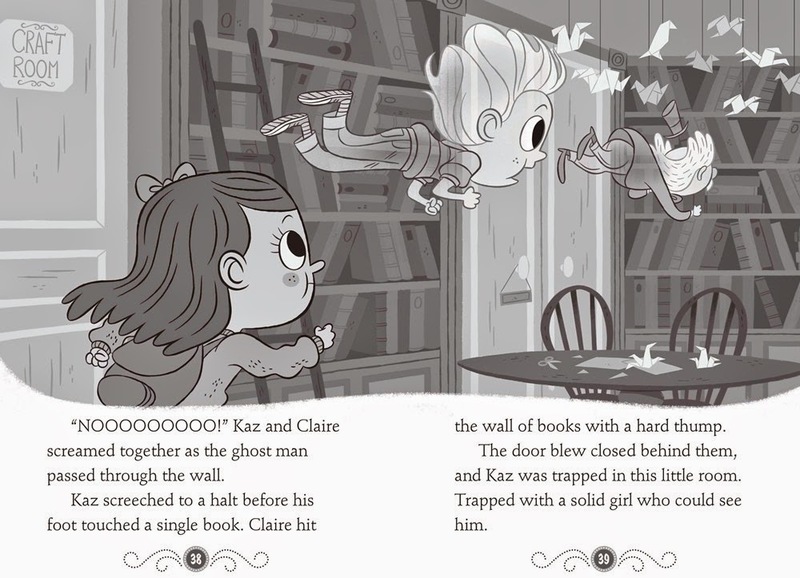 As you can see below when Kaz and Claire are chasing another ghost through the library, the illustrations show the action to guide readers in a crucial moment. The words add enough description for readers to add more to their "mental movies", especially helping them understand the characters' emotions. Enjoy sharing this new series, either as a read aloud with 1st graders who are eager to read more chapter books with you, or with 2nd graders ready to try chapter books on their own. For more fun, check out the rest of The Haunted Library Blog Tour. Tomorrow, I'll be interviewing Dori Hillestad Butler with some questions my students wanted to know. Come back to see her notebooks, her own haunts and more pictures! Series We Love in 2nd Grade! The review copy was kindly sent by the publishers, Grosset & Dunlap, an imprint of Penguin Books for Young Readers. If you make a purchase using the Amazon links on this site, a small portion goes to Great Kid Books. Thank you for your support. 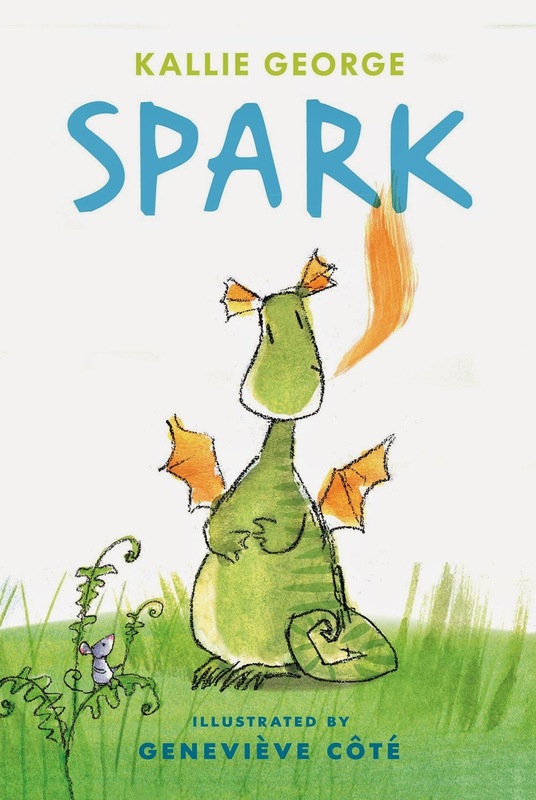 Our second graders loved today's read-aloud: Spark, by Kallie George. And I adored their comments, connections and questions. 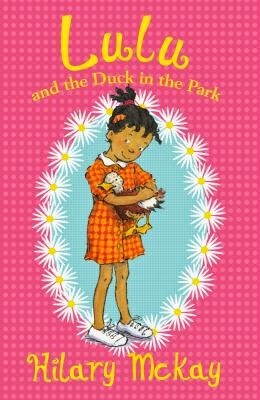 If you're looking for a book to bring smiles and patience to a young reader, definitely look for this charming story. "I can do it!" said Spark. But every time he tries, "WHOOOOSH" out comes a huge flame. He can’t control his fiery breath. Even practicing doesn’t help. I just love how his parents kept their cool (get it?!) and told him that he was still young. When he was older, he'd be able to control his flame. "Whoosh! Out came a big flame." We connected this to our reading. Sometimes I tell kids they aren't ready for a book yet. Maybe when they're in fourth grade, it will be just right for them. They know how hard it is to wait. And they knew how much it meant to Spark that he was patient and tried again. We are excited to Skype with Kallie George soon. Our students want to know how she gets inspired, whether she keeps a writer's notebook, how she deals with getting frustrated when she's writing. The review copy was kindly sent by the publishers, Simply Read Books, but I've already purchased three more copies to share with teachers and families. If you make a purchase using the Amazon links on this site, a small portion goes to Great Kid Books. Thank you for your support.